Lets be honest here....muffins aren't the prettiest things around. These muffins are downright unattractive. However, we don't eat muffins because of their looks....we eat them because they are delicious. These blueberry muffins are particularly delicious. They are light and fluffy (thanks to a combination of sour cream and buttermilk) and the streusel topping is just delightful. They smell wonderful whilst they are baking. So with all that, I think we can forgive them for being a bit homely looking! 1. Grease a 12 hole muffin tray. Preheat your oven to 160 degrees. 2. Place all ingredients except the blueberries, in the bowl with the kneading blade, in the order specified. 3.Select Pastry P1 Time 1 min. 4. Pause the program after 30 sec and scrape down the bowl and blade. Resume program. 5. When the program is complete, add the frozen blueberries to the bowl. 7. Place the batter in the muffin tray filling each cup nearly to the top. A standard icecream scoop is exactly the right size. 8. 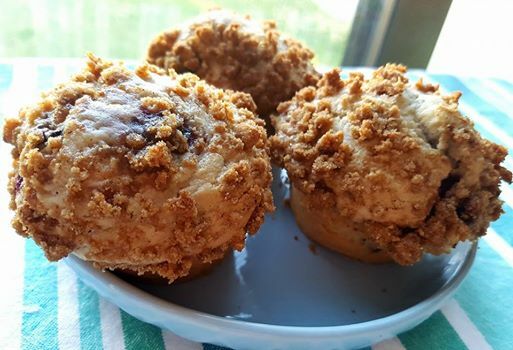 Top each muffin with the streusel topping (recipe below) and then place in the oven for 20-25 minutes or until a skewer inserted in the middle comes out clean or with crumbs clinging to it. 2. Pulse until the mixture resembles breadcrumbs, about 30 seconds.